One of several my artworks that will be included at the ‘October Tales’ exhibit. Please join us for the opening. 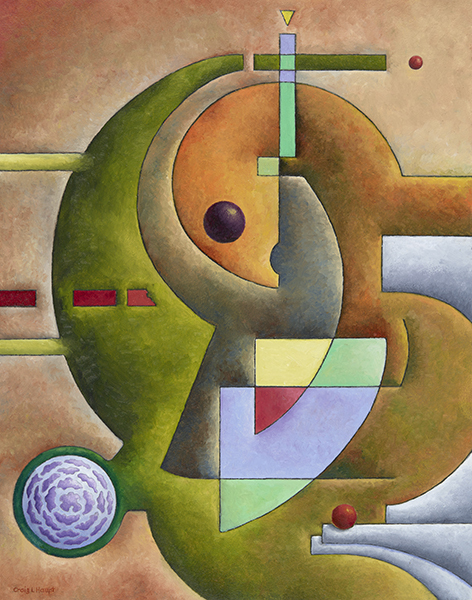 Continuing a small break from the Monday 12 + 12, 12 x 12’s Project and posting six 11 x 14 inch paintings recently completed, this is the fifth of the six. Due to next Monday’s Memorial Day celebration, I will return to the Monday Postings in June. Title-“HEY!! Hands off the Marble” Fourth sequenced post. Posted is the HEY!! 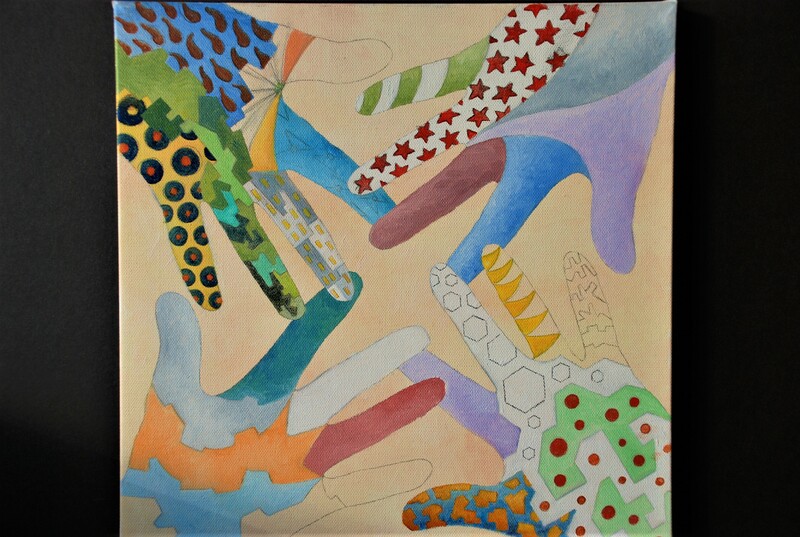 Hands….” Finished painting. In the finished painting, I must admit, not all the fingers or palms/back of hands have patterns even though that was the initial intent. On the upper left hand, Ring finger, the green shapes merge into similar shapes to become fields of crops which then becomes an overhead scene of a farm. The other area of no patterns is the overhead view of vehicles on a road, top right hand. As mentioned last week, the background color on the ‘school visual’ was the white of the paper and this worked because of the hand and patterns being outlined with black marker. For the painting I opted for a darker rich color to push the hands forward as well as adding shadows to heighten the form of the hands. The marble was no particular type of marble, just a generic blend of colors in a Sphere to offset the negative space in the center. I will not Post for the next two weeks due to the celebrations of various Holidays’. Will return for the Posting of Painting Number 10 in January 2017. Be Good!! Be Safe!! Title-“HEY!! Hands off the Marble” Second sequenced post. Posted is the 12” x 12” pencil Worksheet to be used for the ‘HEY!! 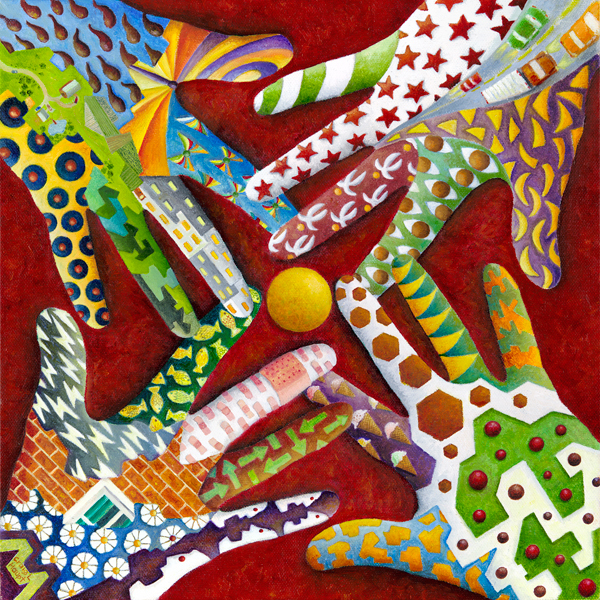 Hands……” painting. 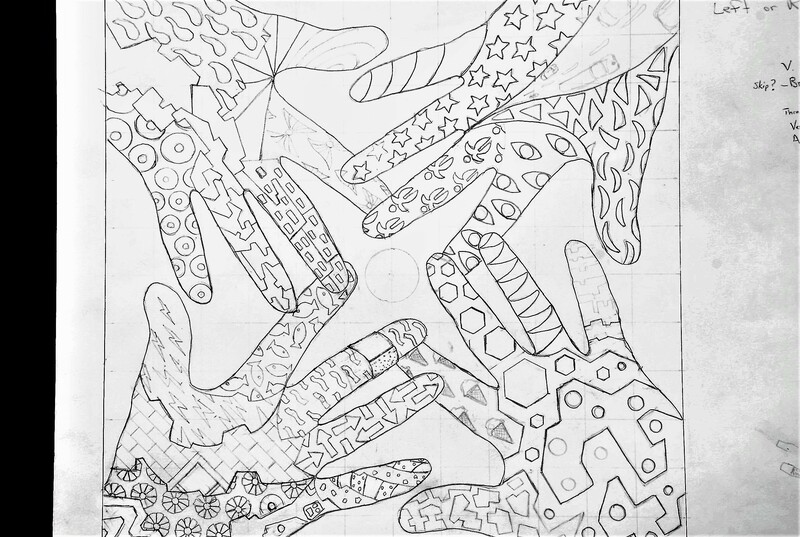 For the projected painting I decided on four traced hands (my hands, actual size). For the patterns, as I mentioned in last weeks post, I included several from the School Visual. The worksheet shows some of the newer patterns added as well as some patterns (fingers that have very light markings) that I am still contemplating. Also as mentioned last week, there is no narrative or theme that guided my choices of patterns and I also refrained from considering balancing the color scheme from hand to hand which might also have swayed the choices of patterns. In other words, except for the symmetry of the hand layout, I chose to be completely random in my pattern choices. Not sure how this will work out. Title-“HEY!! Hands off the Marble” First sequenced post. When I started this 12 + 12 Project, March 7th, the synopsis accompanying that first post, stated that for the 12 paintings in this project that I would select, they would be selected “from ‘doodles’ in my sketchbooks and other related sources”. Well, this is one from ‘other related sources’. I taught art at the elementary/middle school level for five years and one of the art lessons I used pertained to patterns, lots of patterns. 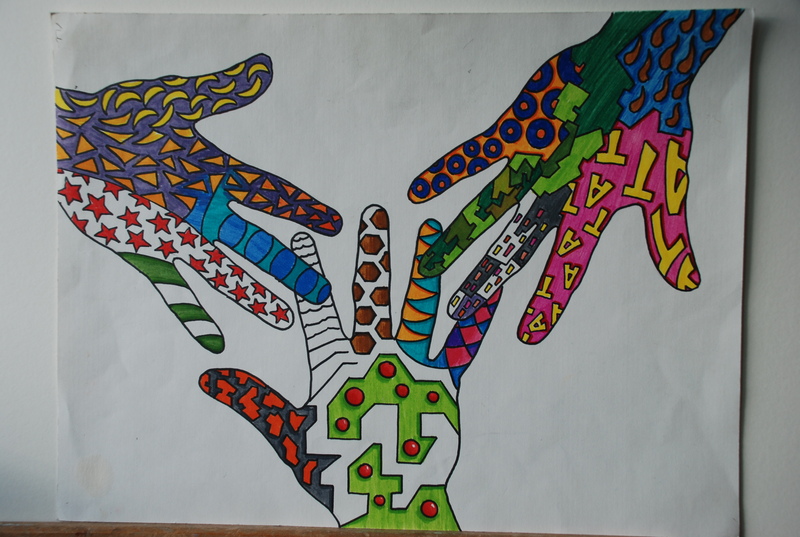 The lesson called for students outlining their hand three times with each traced hand touching another and then adding patterns using Color Markers to create a design. 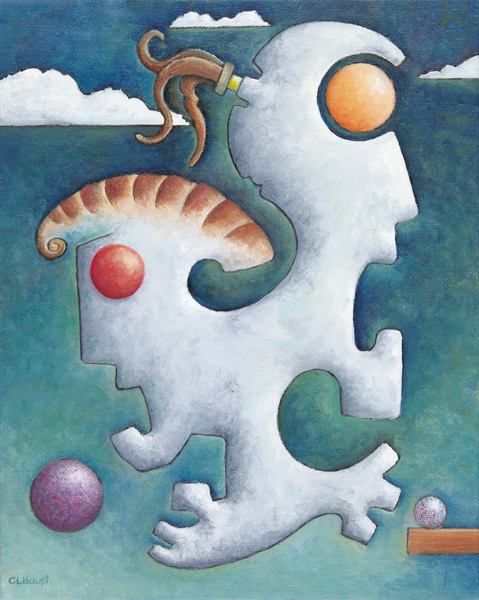 This posted image is the art visual I created (in 2002) and used as an example for the participating classes. I have always wanted to do a finished drawing incorporating the hands/pattern format. I have several worksheets from years past of different attempts and combinations of four, six, and even eight hands, but was never able to work out a finished drawing. This project gave me an opportunity to try again. Next weeks post will show my selected layout and examples of various patterns I hope to use. There are at least 11 patterns on this visual that I had always planned to use in a future finished drawing. A final note, paintings completed so far for this project have incorporated various narratives, this painting is void of any narrative, save a minor one to accommodate a title.